Velocity of Money is a measure of money exchanged over time, typically how often and quickly the average dollar is exchanged per day. Ideally the velocity of money should be steady, as if it is too low or too high it can cause nasty effects like inflation (the mechanics of each complex effect is explained below). In simple terms, in the economic school monetarism which uses the quantity of money theory, money supply (M) and velocity of money (V) represent how much money is in use in the economy each day, and they both relate directly to the General Price level (P) and Quantity of goods and services produced (Q) in the economic equation MV = PQ. While other theories factor the equation slightly differently, the velocity of money is generally one of the central factors of any economy or economic model. What is Velocity of Money ? TIP: Velocity of money refers to the average amount of money exchanged in a given time period, such as a day, not “the speed” at which money is exchanged in real-time. You can see different ways to use the term at Wikipedia, for our purposes it means the average frequency the dollar is exchanged per day in relation to GNP (Gross National Product) or GDP (Gross Domestic Product). TIP: Income and wealth are two different things. This is an important concept to grasp, as, “on average, people with more money save more,” and that directly affects the velocity of money over time (it can have a dragging effect over time as the money supply is increased, but the money is “under a pillow” instead of in circulation. TIP: When Spain found silver in Peru she thought she was rich, it turned out that flooding the money supply with silver just causes hyperinflation (as there is only more money, not more products to buy). Increasing the velocity of money too much too quick has the same effect as dumping tons of new currency into the market at a rapid pace. Turns out Copernicus was as good as economics as he was at astronomy. 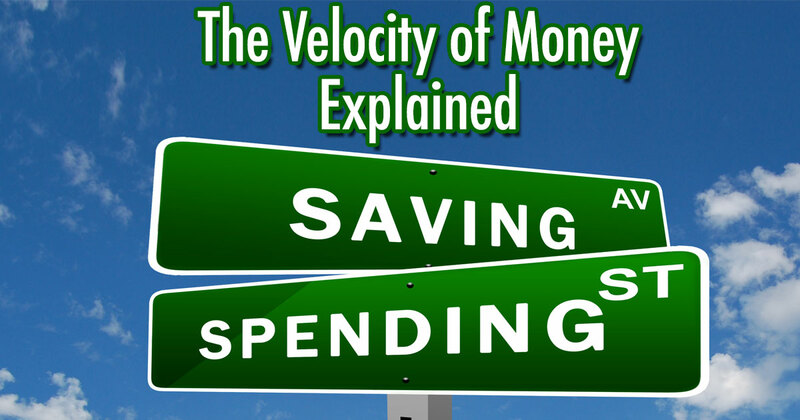 Why Does Velocity of Money Matter? For an economy to stay healthy, money needs to change hands at a steady frequency. Every dollar traded represents either prices or products produced, and that equates directly to jobs, wealth, and even our credit rating. It isn’t just how much money is in the economy that matters; it’s how much total is spent on goods and services per day and where that money goes at the end of the day. Think about it, if everyone in a small town spends money at one single big box store, and that store sends all its money back to headquarters out of state, then we all have no money. If instead, we all spend money at small businesses and circulate it around the town, then our money lasts much longer, and we don’t need to do things like take out loans from the bank to inject money back into the economy. Of course, if we simply stop shopping at the big box store, some lose their jobs, and this can result in a slowdown in spending as well. A lower velocity of money is a sign of deflation (or recovery), and a higher velocity of money is a sign of inflation (or over-inflation). In our above example, the economy would inflate steadily with a mix of small and large business patronage, but it would start showing problems with just one or the other. Ideally, a healthy mix of saving, borrowing, and spending money creates ebbs and flows and a general balance. This can be thrown off (in the short or long term) by psychological factors (group and individual) like an aftershock from depression, by economic factors related to production and price, by bank lending practices, and by tax dodging. These are all types of “hoarding” (i.e. the problematic aspect of saving). What is Velocity of Money? This video explains money velocity in the terms of a small town (similar to our example). FACT: A low velocity of money can lead to deflation or inflation, it depends on what other mechanics are in play. Generally, inflation occurs when the price of goods and services rise, while deflation occurs when those prices decrease. So, a low velocity of money would cause deflation, and high velocity would cause inflation, but not always. What Causes a Low Velocity of Money? Although there are more factors at play, generally, a low velocity of money is the result of people spending rather than saving. If people save rather than spend, on average, then loans must be borrowed, or money created otherwise, to prevent inflation setting. On the other hand, if people spend too quickly, or money is injected too quickly, it can over-inflate the economy. Neither of the above scenarios is good. This money relationship is explained by the equation: MV = PQ (one of a few core economics equations that use the velocity of money to determine the health of an economy). Q – Quantity of goods and services produced. In other words, we either need to borrow or create M, or we need to kick up V. If not, we get deflation and less P and Q, and that means less job growth and wealth. If we “over-correct” M or V, then we can get over-inflation and too much P and Q leading to further issues. FACT: Gross domestic product (GDP) is a monetary measure of the value of all final goods and services produced in a period (quarterly or yearly), similar to Gross national product (GNP) which counts “net” income. When we talk about total money spent on price and quantity of products (and then we factor in a few more things like taxes and subsidies), we get GDP. We can compare GDP, or GNP, to projected debt to see if we need to correct what we are doing via the banks or Congress. There is a lot of psychology and other mechanics behind money velocity. When people fall on hard times they tend to freeze up and spend less, so even a recovering economy can have a slow velocity of money. Or, conversely, a too-good-to-be-true economy could always cause people to freeze up and pull money out of markets. The Federal Reserve has been trying to steady the ship for a while (it is their job), but generally there is only so much that can be done. We can borrow money from the reserve and other central banks, and they can control interest rates. Controlling interest rates can help the FED control saving and spending, but only so much. Lower rates ward off inflation by disincentivizing saving, high rates incentivize savings, but interests rates can’t drop below zero (and thus there is only so much the FED can do to disincentivize saving). Generally, there are only so many tools that the FED has in its tool-belt to balance the markets (see money market equilibrium and The Federal Reserve: Monetary Policy). TIP: Saving can actually be healthy for people and directly and indirectly for an economy. The general taking away is that “hoarding” money is bad for the economy. The middle-class saving rather than going in to debt is NOT hoarding. FACT: The Thrift paradox describes the paradox that while individuals saving money is generally good, collective hoarding is generally bad. Those subject to “composition bias” might assume that since saving money as an individual is good, then saving money as an economy is good, but this is a false assumption (AKA a fallacy). Learn about the Paradox of Thrift. Injecting more money into the bottom where it will be spent in higher amounts (taxation and subsidization). Incentivizing those who are currently saving to spend their savings (tax breaks and other incentives). Regulation, specifically including regulation on financial institutions. One way to “redistribute” money to the bottom is incentivizing institutions to invest in people rather than gambling on Wall Street. “When you have the top 1% getting money, they spend 5-10% of what they earn. When you have the lower end of the economy getting money, they spend 100-110% of what they earn. As you’ve had a transfer of wealth to the top and a transfer of income to the top, you have a shrinking consumer base basically, and you have a shrinking velocity of money.” – The real life Gordon Gekko is supporting Bernie Sanders because of a basic economic principle. Bernie Sanders gets endorsement from the most unlikely person. The video the above Asher Edelman quote is taken from. TIP: We fact-check Edelman’s claim on our page: “People With More Money Save More“. We found that the truth is complex, but generally the claim is true. TIP: The video above mentions repealing Glass–Steagall this is thought to have led to outcomes like the banking crisis in 2008 and current income and wealth inequality issues. With this in mind, others argue that reduced regulations on banks in regards to securities helped to mitigate the financial crisis. This issue too is complex. What Was Edelman Saying in the Video? So what Edelman is saying is, by nature, people with less money spend more (and even borrow to spend more than they have). So if you want to increase velocity of money you address income inequality, wealth inequality, and loopholes that favor the richest. Essentially, you inject more money toward the bottom, less at top, and watch the money “trickle up”. Of course, it isn’t that easy. Some of the problems are not saving. They are tax loopholes and schemes well overdue to be busted by the SEC or long overdue for regulation. Also, if business owners are squeezed too hard, hiring can stop and wages can suffer having a net negative effect. Some of the 1% might be hoarding money (people and institutions), but others are creating hundreds of jobs while only pocketing a few million and paying their full share of taxes. So we have to beware broad brushes here. As mentioned above there are many ways to address our perceived and actual issues. History has clearly shown neither the “greed is good” trickle down, nor the tax the rich to death solution is ideal. The ideal solutions likely lay somewhere in the middle and require some high-level economics, diplomacy, ethics, and lots of political capital to get get moving. Luckily, where we are at the moment is fairly healthy as well. Our issues, as America at least, are long-term projections, not immediate problems per say. Should We Even Care About Deflation and Inflation? By this point, you may be thinking, but wait, it isn’t realistic to have an ever inflating economy, and who cares if it deflates a bit? Shouldn’t we just let the market control itself? Isn’t that better than overcorrecting the market through legislation, agencies, banks, and such? Generally, there is wisdom in both “letting the market correct itself” and lightly guiding the market to ensure a steady economic growth and the right balance of debt and credit. Even though both tactics are sound at times, the general consensus is that we need to do something (or at least Hamilton, Wilson, and others believed this, either way, we currently have a central bank, and we have a Congress with power to act). If congress and the FED can’t fix the problems on their own, then it is solely up to private firms to stop hoarding money. So far, not so good on this, so a strong argument can be made for some sort of intervention. I don’t think the question is whether the hand should be visible or invisible, or if we should or shouldn’t do something, it is more “what is the right move” and “how can we get congress to actually pass smart laws that favor the people”? The CBO says debt level forecasts aren’t looking good, the FED can’t lower rates past zero (basic math), and in general, there is a long list of problems most respectable experts agree on. So, while we don’t want the economy to inflate forever, and while velocity of money isn’t the only way to measure value, it is still worth thinking about how getting money spent instead of saved could help grow the economy and stave off things like crushing debt (and then thus risk our credit as a nation). The velocity of money can be a sign of a growing economy, or it can be a sign that loopholes need to be tightened, or it can be both. One thing is certain, not correcting a problem on any level can lead to lead to issues over time. That is just a matter of statistics. The Quantity Theory of Money is one take on how to understand the velocity of money. TIP: Check out the Khan Academy velocity of money course for more in-depth learning. Economics is not simple, and smart longterm solutions aren’t as simple as playing Robin Hood. What Does Money Velocity Tell Us about Low Inflation in the U.S.? Why Money Velocity Continues To Decline?